This clip in hair extensions are Hera's piano color Malaysian virgin clip in hair extensions, which this kind piano color seems like with highlights. The pictured clip in hair extensions is Hera's default setting according to mainly market requirement, which includes 16pcs clips and cut the hair to 7 pieces. Of course, we can do other settings according to your requirement, such as add clips amount or adjust the pcs amount. 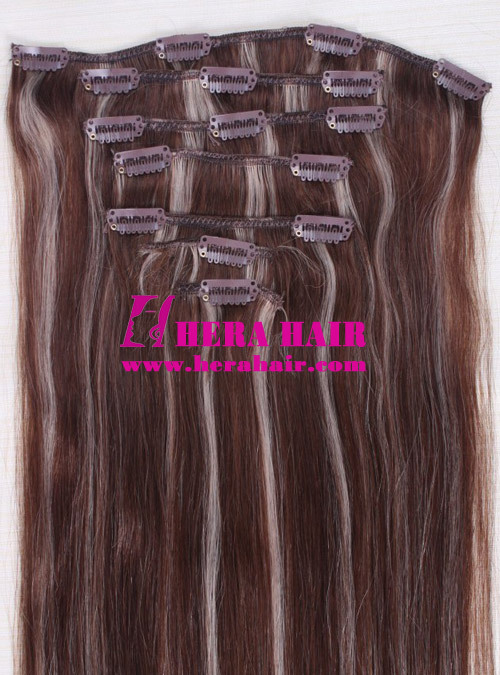 Hera's regular piano color hair weaves or clip in hair extensions are 1.5cm-2cm piano one color. This piano color clips in hair extensions has been adjusted the light color's width so it looks like with little highlights. Clips in hair extensions is very easy to apply and remove and you may do that by yourself so clips in hair extensions are very popular hair extensions also. Hera Malaysian clips in hair extensions wholesale MOQ is 10packs for same hair length and color. And our default clips in hair extensions is 100gram/pack hair. We also can adjust the hair weight per pack and do any hair texture according to your requirement. Except Malaysian virgin clip in hair extensions, we also can supply European virgin clip in hair extensions, Brazilian virgin clip in hair extensions and Indian virgin clip in hair extensions etc. hair materials. We welcome hair salons, hair wholesaler, hair shop to contact us for wholesale clip in hair extensions. Personal buyer for Malaysian clip in hair extensions, please go to our online store to place order, which is free shipping and accept Paypal payment.